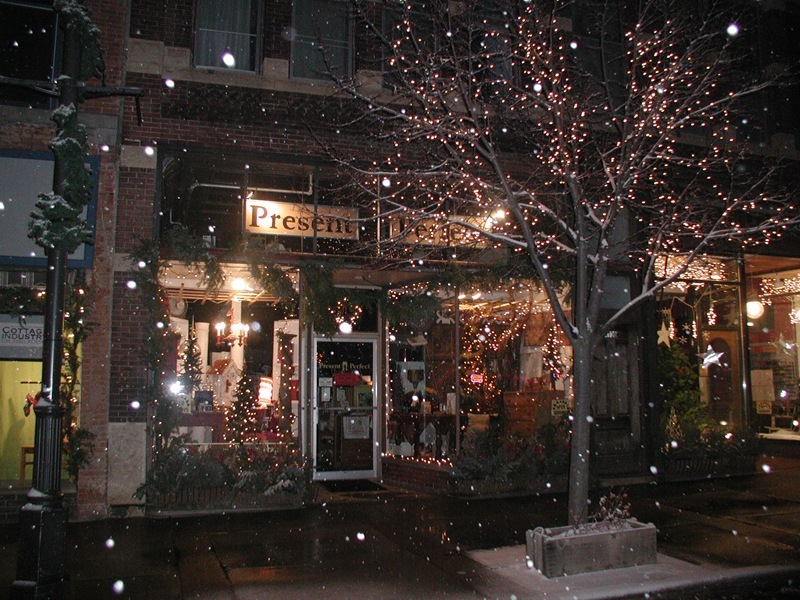 Northfield Mayor Mary Rossing, long time proprietor of Present Perfect on Division in downtown Northfield, announced at last night’s Council meeting that’s she’s closing her store and leasing the space on July 1 to Coldwell Banker South Metro. This means that where there was just one person standing behind a counter, thirteen local agents will now be working out of this space in downtown Northfield. Thirteen people will be bringing in clients, buying coffee and lunch in the downtown, and adding to the vitality of Division Street. 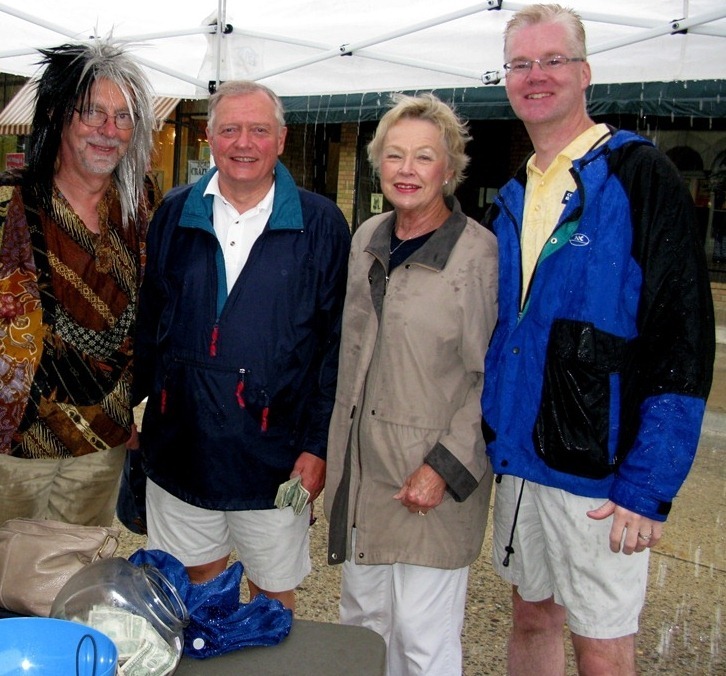 The team of 13 Coldwell Banker South Metro realtors includes Ed Kuhlman, Larry Defries, Jeanette Nelson, and Arlen Malecha, pictured above on a rainy Crazy Daze last July. 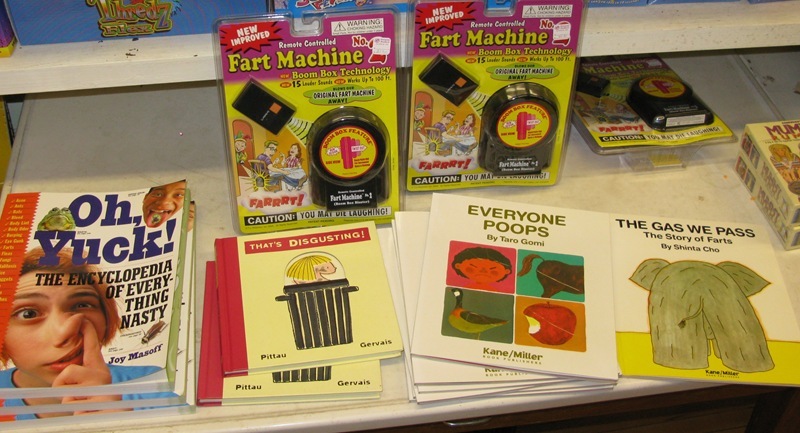 Boogers and farting and poop, oh my! Let it not be said that shopping in downtown Northfield is strictly a highbrow experience. To wit, see this educational display at Present Perfect. That our mayor is the purveyor of this type of material is, IMHO, impressive. I plan to get my Xmas shopping done early this year. Our guest this week: proprietor of Present Perfect, Mary Rossing, President of the NDDC board of directors and Board member of the Northfield Area Chamber of Commerce. We touched on many of the issues that have been discussed in the comment thread (90+ comments to-date) attached to the blog post, Outgoing Chamber president David Ludescher: frustrated but hopeful. I’ve left comments enabled on that post, but I’d like to shift the discussion about CoC (Chamber of Commerce) and CVB (Convention and Visitors Bureau) issues here. Click play to listen. 30 minutes. You can also subscribe to the podcast feed, or subscribe directly with iTunes. 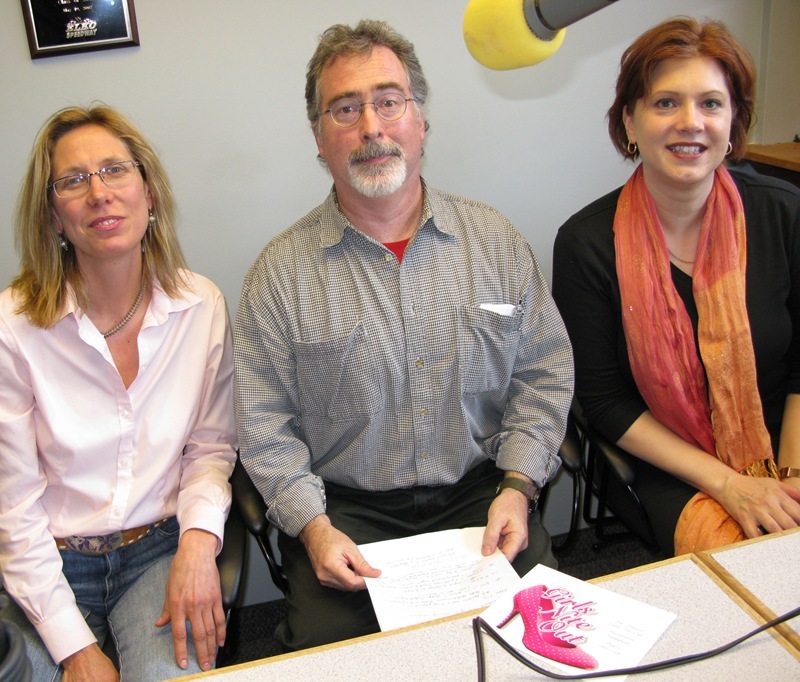 Our radio show/podcast, Locally Grown, usually airs Wednesdays at 5:30 PM on KYMN 1080 AM. 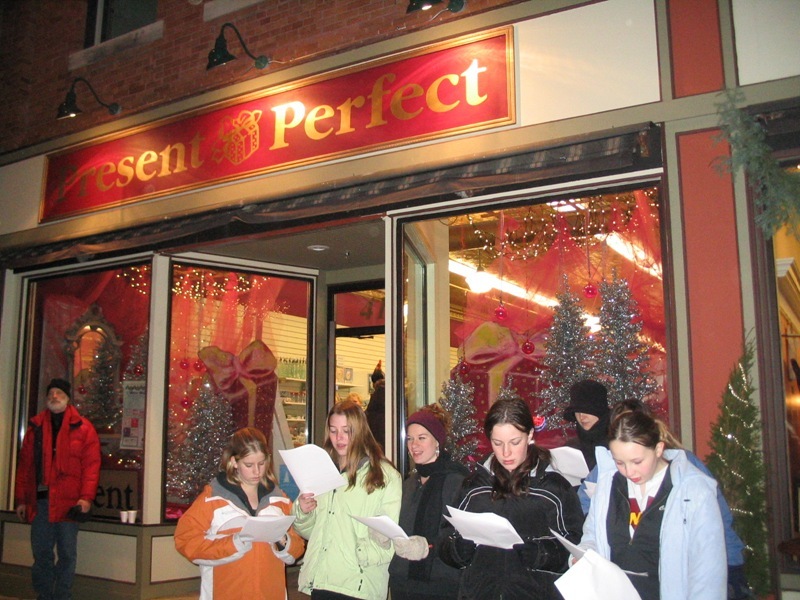 I had to miss the event but a big crowd showed up Friday night at the Upstairs Rueb to celebrate the 10th anniversary of Present Perfect, Mary Rossing’s downtown Northfield store. Left: Doug Bratland has a Northfield.org photo album of 42 photos. Right: Dave Machacek has an ArtOrg photo album of 37 photos. 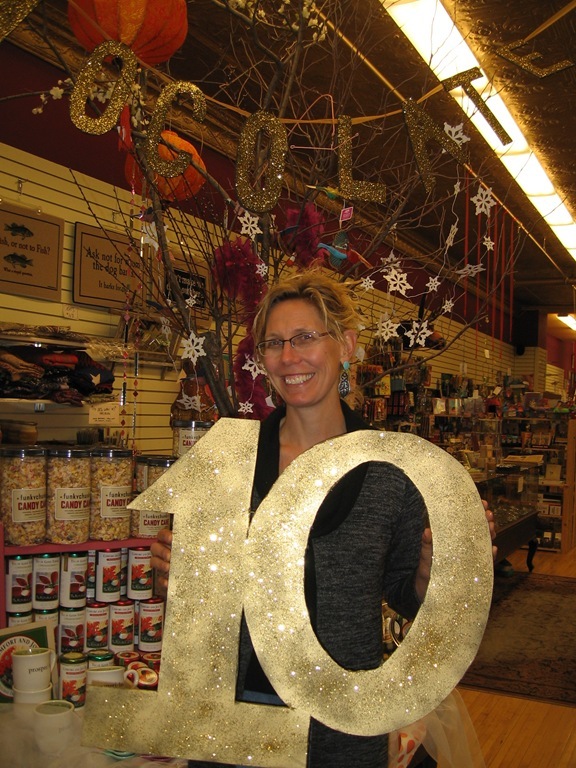 Yesterday, I took the photo on the left of Mary Rossing, proprietor of Present Perfect, holding up the number ten in her store. I’ve taken more than a few photos of her picturesque store over these ten years. Click to enlarge. A few select people (those living in the western hemisphere) are invited to a birthday celebration, coming up at undisclosed location which she’s promised to reveal here Real Soon Now. 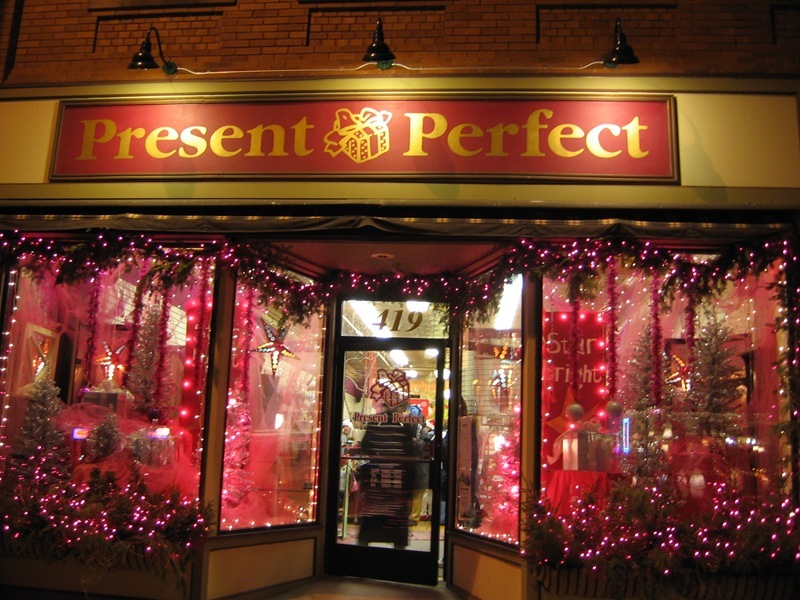 Mary Rossing, proprietor of Present Perfect, was our guest on Wednesday, talking about DJJD and its impact on Northfield retail. We also talked city hall issues. After the show, she and KYMN station manager Jeff Johnson hopped on their horses and headed out to the American Legion Ballroom for the DJJD Joseph Lee Heywood Award Dinner. 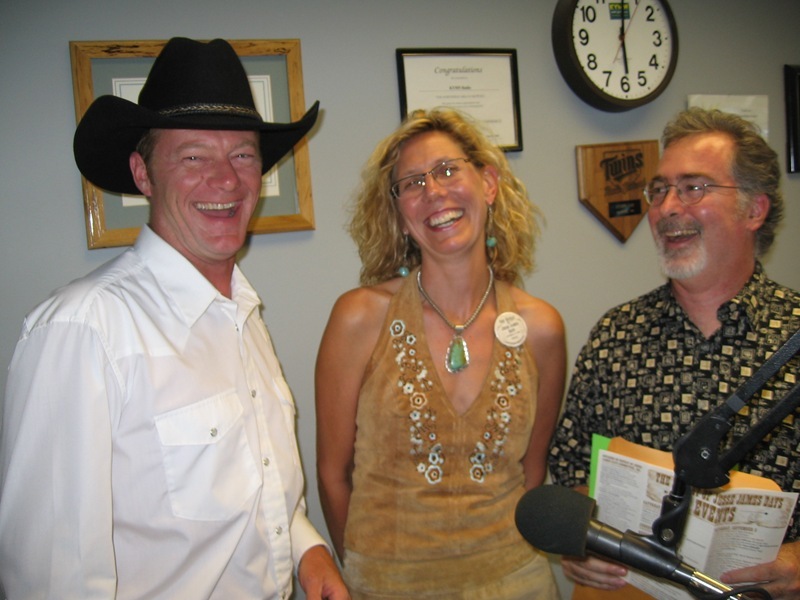 Our radio show/podcast, Locally Grown, usually airs Wednesdays live at 5:30 PM on KYMN 1080 AM. You can also subscribe to the podcast feed, or subscribe with iTunes. We seek your comments and suggestions. … found the Jesse James horseshoe this morning, just before 7 a.m. The prized shoe was magnetized and hanging on the back of an air conditioning unit at the public library on Washington Street, one of the key clues. 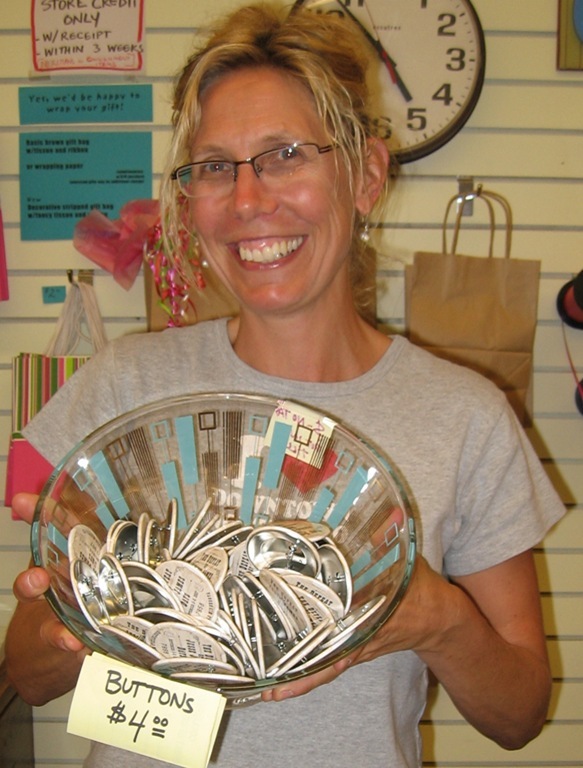 Rossing said she was out of town until Tuesday and thought for sure her chances of finding the prize were slim. Nonetheless, on Wednesday and Thursday morning, she was out and about diligently looking. But it wasn’t until Friday morning at 6:40 a.m., when hunt organizer Franklin Lee read the fifth clue on KYMN that Rossing knew for sure. By 6:41 a.m., she was at the library. Rossing has a registered button and says she plans to donate a portion of the $1,000 bounty she won to the Friends of the Library. See all the clues on the Defeat of Jesse James Days’ horseshoe hunt page. And see the site of the Friends of the Northfield of the Public Library, the lucky recipient of Mary’s generosity.